The fact that I'm posting a picture of a cable tray is a sure fire way of telling that Andy has been down for another visit. 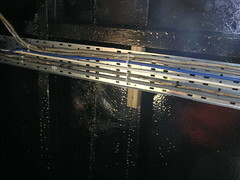 This particular tray has now been installed in the fish hold and although not finished, due to a shortage of trays, is work that was desperately needed. This is a job that's been getting more and more pressing each time something is dropped down into the hold from the deck above, catching the dangling cables on it's way. Andy did double duty over the weekend, also giving us an interesting and entertaining slideshow on his Antarctic exploits a few years ago. The wooden boat in front of Lady Jane there is Lilagina. She is, obviously, quite old. Anyway, she has been pretty much neglected these past years and recently her owner was called, informing him she was starting to sink. Graham, her owner, had apparently pumped out about 10 tonnes of water and had to keep pumping to stay ahead of the leak she seems to have sprung. The last time I saw Graham, he told me he had pushed a wad of sawdust from the seaward side into the area where the leak was, using a broom handle and a rolled up carpet full of the stuff. Apparently, the sawdust gets pulled into the leak with the water flowing into the boat, catches, expands and stops the leak. That sounds just so amazing to me. While I'd rather not have a wooden boat with a leak in the first place, knowing something as simple as that could make all the difference while arrangements for a more permanent repair are made. 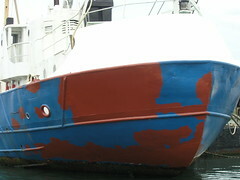 I intend to do as much painting on Lady Jane as I can over the summer. Last summer was pretty much a write off when it came to painting outside, so this year I plan to try to make up for that. 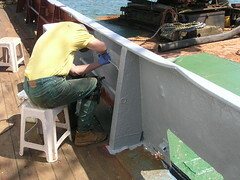 The recent activity in replacing the steel plate astern has reminded me of just how good that primer looked when it was spray painted on, in comparison to using a roller, and certainly a brush. Most of the painting I do on board at the moment is with mini rollers, purely for the convenience of it. 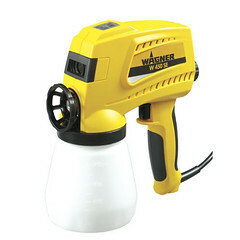 While looking for something else I discovered this Wagner electronic spray gun, which seems quite appealing as I don't have to mess about with compressors or 'big' power to get spray painting done. The issue I have with compressors right now is that of three I have on board, the small one, which doesn't really have enough puff to spray anyway, has a problem with the pressure switch, the one I bought on eBay is still in pieces and I don't want to use the boat compressor if I can avoid it, as it's crucial for starting the main engine. So far as I can see, the only downside is the weight - using a 'normal' spray gun gets tiring after a while, so that thing would wear a guy out in half the time! Anyone else have experience or opinions on this? That red primer really stands out. As well as priming the new steel plate, the area below has also been touched up. Even looking like a patchwork quilt, the paint really makes that repair disappear into the background. 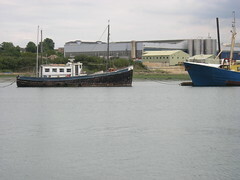 It won't be long and the stern will be blue again, hiding almost all evidence of the Humber Star's little 'excursion'. Next will be to get a bit of long overdue artwork done - painting 'Lady Jane, Southampton' on the stern. 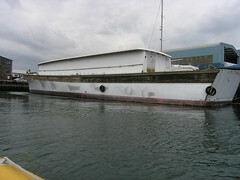 Here's another boat project, just arrived, going on near me. To give you an idea of the scale, look at the car on the bow, and the yacht towards the stern. I know nothing about the boat, or the people, just yet. But no doubt will get to know more as the months progress. I look at that and think about how I felt when I first got Lady Jane - come the 24th of this month, it will be five years. While I've been busy with the green, Fred has been busy with the white. That space had originally been cleaned up, ready for painting, by Patch some time ago now. That fresh green against the bright white certainly looks good, and the engine room in general is so much brighter now (I know there's a lot more green to be painted there still). Ideally this kind of work would be saved for the winter, but the reality it's just not practical to work in the engine room when it's cold. On a side note, I find it vaguely amusing that Fred ended up going home to his wife that day with more green on him than white - despite the fact that he only painted with the white. Sorry about that Jenny! 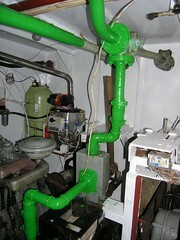 I've made a start with painting the seawater pipes green. It doesn't look much, but painting these pipes takes ages. You think you are done, then look at the pipes from a different angle only to find there is almost always at least one spot that's been missed. 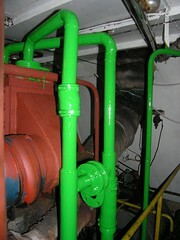 To cap it all, there is seemingly miles of seawater piping down in the engine room. It does look good though, even if I say so myself. 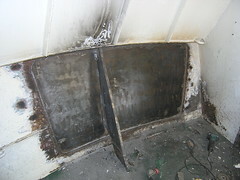 The picture shows some new steel plating, which repairs the damage done by the Humber Star to Lady Jane's stern last year. The insurance company had finally agreed to the quote submitted to them. The silence from me over the previous week is on account of the fact that I had to take time off to be on board Lady Jane while the contractors effected this repair. This should never have happened in the first place, consequently I view all the time I've spent on this issue has a complete waste. Still, the contractors have done a good job so far. There is still painting, shelving and putting everything back to do. That will have to be done over the next few weekends. For whatever reason, the original light in the head was wired into the boat's 110V DC system, whereas most of the other lights, except for a few in the engine room, run on the boat's 24V system. 110V DC is only available to me when either the main or donkey engine is running, so using this light has never been practical for me. Besides, there is no bulb and I still have no idea where to buy regular size screw in 110V DC light bulbs. My original plan was to switch this light over to my 24V DC system, something which is available more or less throughout the boat from my battery bank. It has emerged that there are two issues with this change to 24V, asides from the re-wiring effort. The first being the availability of 24V DC screw in bulbs, again I have no idea where to get new ones. The second, and more importantly, is the amount of power those bulbs use. While I'm cutting back and using low energy bulbs elsewhere, it makes no sense to then go and stick in a bright, power hungry bulb just to sit/stand and do the business in the head. It is a fact that being more environmentally, and therefore energy consumption, aware means fundamental changes in peoples personal expectations are necessary, in this case providing sufficient light for the head without going over the top. I had, for a while, used one of those really useful 'dot' lights, but after dropping one into the bowl (it's a seawater flush so that was the end of that), realised a better, more permanent, solution was needed. Besides, while the dot provided plenty of light to use the head, it never really lit the place evenly for long term use. The solution I've come up with, although it's still a work in progress, is to use LEDs connected in parallel and strung along the deckhead (roof) of the head, powered by rechargeable batteries and controlled by a simple switch, and all self contained in a little box. There is no wiring needed from elsewhere. More LEDs in the 'string' means more light, so I can easily match the light needed with more or less LEDs. Power consumption of LEDs is extremely low, so the rechargeable batteries should last some time between charges. The light is on a timer, so the light cannot be inadvertently left on. I'd also toyed with the idea of providing some kind of power feed, probably solar from the like of the solar garden light set-ups you can buy, to keep the batteries topped up almost indefinitely. In reality though, I'd rather have everything driven from the main 24V battery bank and manage power creation for that bank only. I've not yet found 'professional' looking reflectors for the LEDs, so that bit still looks a bit crude. I can see this kind of technology spreading elsewhere on Lady Jane, though with variations on the switching and timing mechanisms. For example, some kind of light sensitive lighting in the key parts of the boat, which should help save visitors, and me for that matter, from bumping about in the dark. This recent spell of sunny weather also prompted me to ship another load of freshwater across to Lady Jane. 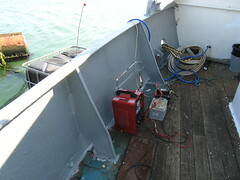 The photo shows the paraphernalia needed to get the water into the storage tank at the stern. Over the side, you can see the water container I use to get the water from the marina to alongside - a 1000 litre IBC which is on my platform, Willcarry 1. On deck is a spare 12V battery, along with a charger to top the battery off at the same time. The small water pump I use is actually submerged in the ICB. As it happens, it's quicker to pump the water aboard than it is to fill the ICB at the marina. Something I'm very pleased with, is just how much I have improved in handling the platform when towing and manoeuvring it with the Old Sow. In reality, I've found that the secret of successful towing on the water is all in the setup of the lines securing the inflatable and the platform together. Provided the RIB engine is sufficiently far enough behind the platform, and the lines for towing both forward and astern keep the platform neatly alongside the platform when under tension, manoeuvring becomes pretty straightforward. One thing I really love about being afloat is the constant change around me. 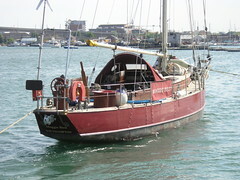 Here you see Maggie Best, my new neighbour who arrived on the moorings just behind Lady Jane during the weekend. Even a cursory glance at her will tell she is a venerable old lady. 97 years old I think her owner told me. Now that's a boat that's obviously had a lot of time and attention lavished on her. I'm also told by someone that Maggie Best was also hit by a ship of some sorts when she was on that same mooring some time ago. Here you see Fred getting stuck into a tricky bit there with his roller. Getting this second coat on has taken longer than I would have liked, on account of the poor weather forecast for the Monday a few weekends ago, but it is at least continuing. 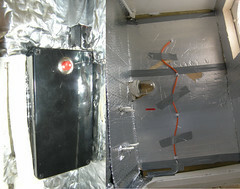 Don't underestimate how much work goes into painting on the insides there, as all those edges have to be painted around. With appropriate tea and lunch breaks, of course, painting that side by myself takes pretty much all day. Hopefully it won't be too long before this is all looking white and beautiful, which in turn motivates me to paint more. This is definitely one of those ahh moments. 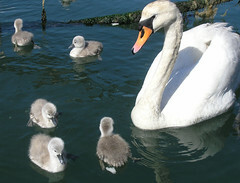 Here mrs swan shows of her brood of babies. These chicks can only be a few days old, at most. In truth, the tart only came over because of the bread Fred threw into the water while I fetched my camera! Also, on the wildlife front, I had a duck nosing about on Lady Jane like she owned the place. I suspect she may have been looking for a place to lay her eggs. Much as I'd like to play host to a new family of ducks, I suspect the noise and activity on deck over the weekend has helped persuade the duck to look elsewhere.